A very nice appetizer all will love it. Chop the onion and fry it in 5 tbsp olive oil over medium heat until it is soft and changes the colour. Add zucchini and soute . Stirr till the zucchini is soft. Beat eggs and flour in a bowl , till they are well blended. Add blk pepper,mint leaves and dill mix well. Fold feta cheese ,cooked onions and zucchini into the eggs and flour better. Heat oil in a frying pan and put 2 tbsp of mixture at a time to fry fritters and repeat this process. Take out the fritters when they are golden from both sides. Drain the papper towels and serve hot with chilli garlic sauce or ketchup. This seems like a nice and easy recipe. Thank you. no need of salt as cheese is added or u missed out salt? 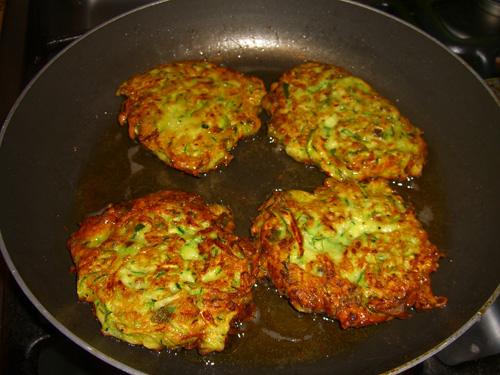 zucchini cutlet is really yummy.zucchini is a low calorie vegetable.good filling with zucchini.